From critically acclaimed author David Joy comes a remarkable novel about the cover-up of an accidental death, and the dark consequences that reverberate through the lives of four people who will never be the same again. When Darl Moody went hunting after a monster buck he's chased for years, he never expected he'd accidentally shoot a man digging ginseng. Worse yet, he's killed a Brewer, a family notorious for vengeance and violence. With nowhere to turn, Darl calls on the help of the only man he knows will answer, his best friend, Calvin Hooper. But when Dwayne Brewer comes looking for his missing brother and stumbles onto a blood trail leading straight back to Darl and Calvin, a nightmare of revenge rips apart their world. 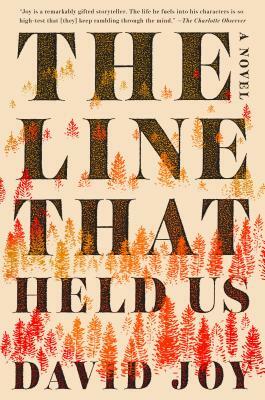 The Line That Held Us is a story of friendship and family, a tale balanced between destruction and redemption, where the only hope is to hold on tight, clenching to those you love. What will you do for the people who mean the most, and what will you grasp to when all that you have is gone? The only certainty in a place so shredded is that no one will get away unscathed. David Joy is the author of The Weight of This World and Where All Light Tends to Go, an Edgar finalist for Best First Novel. His stories and creative nonfiction have appeared in a number of publications, and he is the author of the memoir Growing Gills: A Fly Fisherman's Journey. Joy lives in Sylva, North Carolina.